Please note: All crochet terms used in these patterns are UK terms. UK double crochet = US single crochet. UK treble = US double crochet and so on. 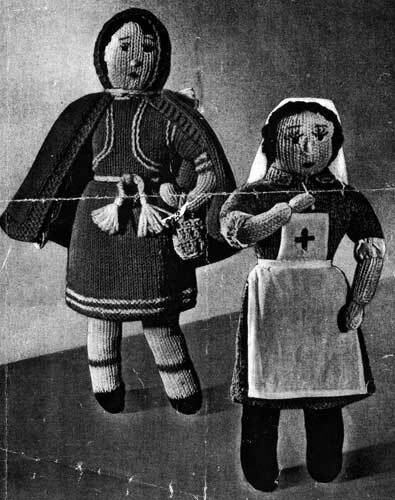 The original doll was about 12 inches in height. With red wool cast on 40 sts for half the skirt and k 2 rows. Join white wool and k 2 rows. Repeat these 4 rows once, then work remainder of skirt in red wool. Work 35 rows in st st, then dec for waist. Next row: P2tog all along. Place sts on a spare pin, and work the other half of skirt in the same way. Begin with the shoe by casting on 4 sts with brown wool. P 1 row, then change to white for socks and work 8 rows. Join red wool and work 2 rows. Change to flesh colour wool and work straight for 30 rows. Leave this leg on a spare needle or stitch holder and work the second leg in the same way. knit the first 10 sts of the second leg with the same colour on to the same pin, leaving remaining 10 sts on a safety-pin for the back. Continue with the front, working 27 rows in st st.
Now join the skirt by placing one half of the skirt in front of the sts on the pin, and knit each skirt stitch together with the corresponding stitch on the pin. Work 11rows in st st, increasing at each end of the 4th and 8th rows. Cast on 8 sts for sleeves at beginning of next 2 rows, then work 12 rows straight. Cast off 16 sts at beginning of next 2 rows. Change to flesh wool for face and work 4 rows. Next row: K1, * k2tog, k2; repeat from *, ending with k1, instead of k2. P 1 more row, then k2tog all across. Return to remaining 2 sets of 10 leg sts left on holder, and work to match. Using white wool and with right side facing, pick up and k 15 sts along one sleeve edge. K 1 more row in white, then k 2 rows red, 2 rows white, 2 rows red. Change to flesh colour and k 1 row. Next row: (P3, p2tog) 3 times. Work 20 rows of st st on these 12 sts decreasing at the end of 9th and 16th rows. Cast off 1 st at beginning of 21st and 22nd rows. Work 2 rows more. Cast off. Work the other cuff and arm in the same way. Press lightly, then join the leg seams gradually, firmly stuffing the doll as the seams are made. Continue with the side and arm seams, working up to the top of the head. Join the side seams of the skirt. Embroider the mouth, nose and eyes with small straight stitches and outline the eyebrows and eyelashes. For the hair, work from the crown of the head down to the neckline at the back with long straight stitches. With white wool crochet a chain 10 inches long, make two small tassels for the ends and tie this round the waist. With white wool and the embroidery needle, work a double row of stem stitch in the shape of a bolero on bodice of frock, and round the neck to cover the join between red and flesh colour. If you have a little rouge or lipstick, a touch of this on the cheeks is effective. Bind the wrists with flesh-coloured wool. With red wool cast on 90 sts and k 5 rows. Next row: K4, p to last 4 sts, k4. 1st row: K4, * k3, k2tog; repeat from * to last 6 sts, k6. 2nd and alternate rows: K4, p to last 4 sts, k4. 3rd row: K4, * k2, k2tog; repeat from * to last 6 sts, k6. 5th row: K4, * k 1, k2; repeat from * to last 6 sts, k6. 7th row: K4, k2tog all across to last 4 sts, k4. Next row: * K2tog, yo, k1; repeat from * to last st, k1. Work 25 rows straight. Cast off. Press lightly, join up seam across top of hood, then with white wool crochet a chain 17 inches long, insert this through holes at neck, and attach small tassels to each end. Using the string, make 3 ch, and join into a ring by a slip-st.
1st round: 2 ch (for 1st tr), then 7 tr into ring. Join with a slip-st.
2nd round: 2ch, then work * 1 tr in first tr and 2 tr in next tr ; repeat from * all round. Join with a slip-st.
3rd round: 2ch, work tr into tr all round, join with slip-st.
4th round: 1 ch, work 1 dc into every tr of previous round, join with a slip-st.
Work 10ch, fasten off, and join chain to opposite side of basket for handle. About 12 inches in height. Cast on 4 sts for half the skirt with grey wool, and k 6 rows. P the next row and continue straight in st st for 35 rows. On next row p2tog all the way across. Put sts on a spare pin and work other half of skirt in same way. Begin at the foot by casting on 4 sts with black wool. P 1 row then continue in st st for 40 rows more. Leave this leg and work a second leg in the same way. Knit the first 10 sts of second leg with the same colour on to the same pin, leaving remaining 10 sts on a safety-pin for the back. Now join the skirt by placing one half of the skirt in front of the sts on the pin, and knit each skirt stitch together with the corresponding st on the pin. Work 11 rows more in st st, inc at each end of the 4th and 8th rows. Next row: K1, * k2tog, k2; repeat from * all across ending k1 instead of k2. P 1 row, then k2tog all across. Return to remaining two sets of 10 leg sts and work to match. Using grey wool, and with right side facing, pick up and k 15 sts along one sleeve edge. K 5 rows more, then change to flesh colour and work in st st K1 row. Work 20 rows on these 12 sts, dec at end of 9th and 16th rows. Cast off 1 st at the beginning of 21st and 22nd rows. Work 2 rows more, then cast off. Work other cuff and arm to match. With grey wool, cast on 18 sts, and k 1 row, increasing in every alternate st.
K 5 rows, dec at each end of the 4th and 5th rows. Press lightly, then join the leg seams gradually, firmly stuffing them as the seams are made. For the hair, work from the crown of the head down to the neck-line at the back with long straight stitches. Sew the cast-on edge of the collar round neck. Narrowly hem the four sides of a seven-inch square of white material, fold under one corner and sew the folded edge round the head. Hem both sides of two strips of white material five inches long by one inch wide and gather round cuffs of frock. Make a small white apron and embroider a red cross on the bib. If you have a little rouge or lipstick, lightly colour the cheeks with this. Bind the wrists with flesh-coloured wool. The original publication of this pattern is in the public domain, however, this digital version is copyright Sarah Bradberry, May 23rd 2012. All rights reserved.